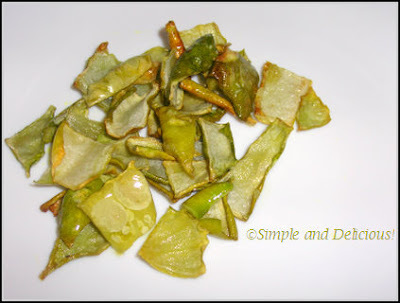 Ash Gourd Peel Fries / Kumbalanga Tholi Kondattam | Simple and Delicious ! Before going to the recipe, you have a request from my little poetess to visit her blog. Hope you all will encourage her by leaving your valuable comments. Kondattams / vattals always take me back to the home courtyard. Except in Monsoon season, there would be a kaitholappaya (mat made with the leaves of a plant like pineapple plant which produces a a very pleasant smelling leaf like flower kaithappoovu) or a vattoram / muram ( a flat shallow basket type sieve to winnow grains which is made with bamboo) in the courtyard of every house. The product may be different in each house, it might be spices like coriander, chillies, turmeric, kondattams , paddy, dried coconut etc. If it is mango season, then it would be naturally mango pieces! Can't forget the taste of salted, little bit dried raw mangoes..:) The mat would be moving wherever the sunlight falls until late afternoon! And this is the one my mother used to make while making other kondattams like bitter gourd / pavakka vattal or chilli / mulaku kondattam. A very tasty one, if dried or not. I prefer the raw peel fries which goes well with or without rice! Mix everything together except oil. Do shallow fry in oil. Peel ash gourd. Wash and mix the peels with salt. Let it dry in sunlight. You can fry them when it is too dry or not. You can store it when it is very dry. See the pumpkin peel / mathanga tholi recipe here! This goes to Currybazar for RCI Kerala Event! Seena, wow...this took me down the memory lane-i wd stand guard to the kuvalya (kumbalanga) saali(tholi) as it wd be sundried..it wd shrink considerable in amount and amma's plain salted ones were a treat with meal!! Tks for posting.. I saw the parotta too in your earlier post. That looks like amasterwork. I am going to try them when i have time. It is so thin sp transparent. When i make them hope i get it so thin. Looks interesting Seena! You can send this as entry to RCI-Kerala, being hosted at my blog. i have never eaten these seena..they do look delicious! oho! tholi kondu ulla paripadiya alle? amma makes similar dish with ethakka tholi and dad doesnt touch it :) hehe.. havent heard this one before! Seena, never heard of this before, thanks for the post! Never heard of this. Looks so crispy. me too nvr heard of this, will try it, if i come across one. Totally a new thing for me. Looks good to try with rice. Just came across your blog. This particular kondattam is new to me. I usually throw out the peels after cooking with ash gourd!! Will try this when I can manage it next. Nice way to make use of ash gourd peels Seena!